Bell Alarm Clock Guarantees You Will Wake Up | OhGizmo! Is Your Alarm Too Quiet? Hook Up A Pair Of 140-Decibel Horns! I’ve said it before and I’ll say it again, it takes a whole lot of alarm clock to get me out of bed in the morning. A whimpy electronic beep or even music at full volume just isn’t enough to instantly snap me out of my nightly coma. What I need is something like this. 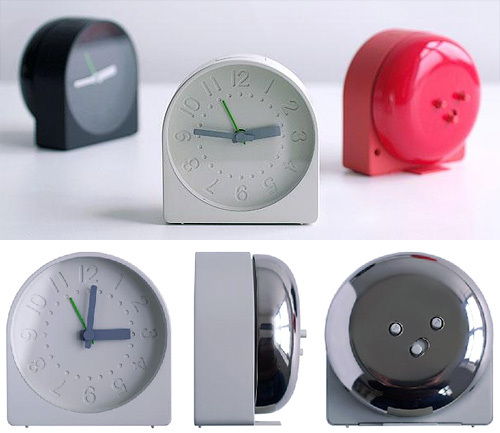 Designed by Sam Hecht, the Bell Alarm Clock is not unlike the classic double-bell alarms of yesteryear, except that it forgoes the often inaccurate wind-up clock mechanism for a battery-powered electronic version, and it features a single large bell instead of two smaller ones. Simple, but loud and effective. It’s available in your choice of red, black or white finishes from Charles & Marie for $65, but I prefer the white version since the bell on the back has a classy chrome finish.